Here's a WIP shot of the Librarian. 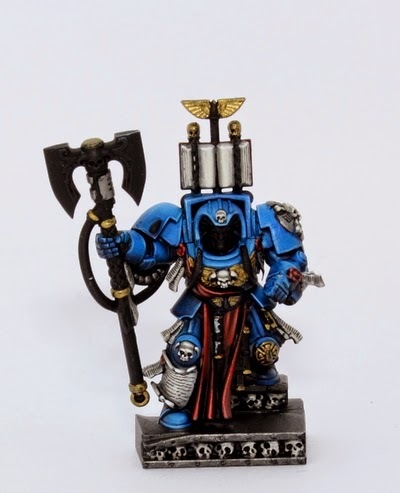 The colour scheme for all the Terminators in this set is pretty much the Ultramarines colour scheme, but keeping the Blood Angels insignia and whatnot. 'Heresy' some may exclaim, 'customer's wishes' I calls it. I offered to change the insignia to Ultramarines stylings, but it wasn't required. Not that this makes a huge difference with a Librarian, but the shoulder pads stay blue on this one!